Finding true ecotourism companies isn’t easy. While the tourism industry worldwide has latched onto the term ‘ecotourism,’ in many cases it’s more propaganda than reality. Especially in heavily-touristed areas—like the Caribbean Islands—it’s difficult to find efforts that are actually low impact, sustainable as possible, and educational. However, some companies are beginning to make headway in a region known for all-inclusive resorts and big cruises. One such company is Explora! Ecotour in the Dominican Republic, run by passionate young naturalists, Manny Jimenes and Olyenka Sang. Oly Sang and Manny Jimenes. Photo by: Tiffany Roufs. Jimenes and Sang note that they actually prefer the term “sustainable tourism,” which really encompasses their company’s philosophy. For example, Explora! Ecotour works very hard to make sure it’s supporting local communities near nature reserves and parks, rather than the big operators on the island. Explora! also does weekly trips with all local groups, in an effort to increase environmental education for Dominicans and show locals some of their own country’s astounding beauty. Many tourists in the Dominican Republic never get beyond the confines of their resort, but for those travelers with a desire to encounter more of the island’s incredibly rich biodiversity, wild ecosystems, and warm people, companies like Explora! are a real alternative. A cattle egret in mangrove trees in Estero Hondo Marine Sanctuary in the Dominican Republic. Photo by: Tiffany Roufs. Mongabay: How did you get started in ecotourism? Olyenka Sang and Manny Jimenes: It just kind of happened. We originally started out as well, explorers, just as our name says. We loved nature and wanted to get out and explore everything that our country had to offer, it wasn’t until we started seeing the amazing natural resources and biodiversity, that we automatically felt a sense of responsibility. A responsibility to put these places on the map for locals (believe it or not most Dominicans don’t get out and see the rest of the country) and to help preserve them or turn back the time, if possible, on some of the damage already caused. Mongabay: What does “ecotourism” mean to you? Olyenka Sang and Manny Jimenes: Ah…”ecotourism”…the most popular term used to describe any tourism company in the Dominican Republic, sadly, to most it is just a trend. Eco tourism is of course, sustainable tourism, we actually enjoy the latter description even more. What sustainable means is finding a balance and harmony between the natural resources and the communities that live around these “green” areas. The communities play such an important role because they can be either the first line of defense or attack, once they see that they can benefit from preserving these places, then they will do their best to preserve them. This is why eating from the locals for example, apart from the wonderful cultural experience that it is, is so important. It is a way to give thanks to them for keeping these parks intact. There are many examples of this, buying at their small colmados (small grocery stores found all over the country), giving tips to the local guides, boat captains, etc. Sometimes, without even realizing it, after a nature tour, you have helped out a few families in one single community. When you practice “ecotourism” you have great respect for the place you are visiting as well as the people; this “respect” you will carry with you always once you are gone from these “green” places. Oly and Manny looking for manatees while kayaking. Photo by: Tiffany Roufs. Mongabay: When people think of the Dominican Republic, why should they think of more than all-inclusive resorts? Olyenka Sang and Manny Jimenes: When you go to these resorts, you are not exposed to the real Dominican Republic, to it’s food, to it’s culture and most importantly to their real natural resources. You are kind of “trapped” in this artificial world of politeness and miss out on that authentic Dominican “charm” that you can only find in the most remote areas. It is very easy to visit an all inclusive resort and leave thinking that the Dominican Republic is just another Island with white sandy beaches, but we are so much more than that. We are the most biodiverse country in the Caribbean, complete with the tallest peak in the Caribbean, sand dunes, deserts, rainforests, pine forests, cloud forests, waterfalls and so much more, it is simply a shame to just lay out in an artificial beach for days and miss all this. Mongabay: What are travelers most surprised by on your tours? Olyenka Sang and Manny Jimenes: What most surprises our travelers is that we actually provide what we promote and more. Something else that is very surprising is the fact that we don’t sugar coat things, we like to tell it like it is; both good and bad. I think they really appreciate this honesty on our part. During our tours we try to make people feel like they are out with some local friends as opposed to traditional tour guides and, for the most part, I think this is exactly how it goes and for many this is pleasantly surprising. Mongabay: What wildlife can people expect to see in the Dominican Republic? Olyenka Sang and Manny Jimenes: We have 31 endemic species of birds, so it is safe to say that our country is a birder’s paradise. We have two types of endemic iguanas, american crocodiles, solenodons (which is a mammal that’s pretty much a living fossil, it’s existence dating back millions of years), hutias (another rodent like creature, also a living fossil). Being an island, we kind of got cheated on the mammals. We also have manatees (also known as sea cows) and once a year (January to March) we are visited by humpback whales that come here for mating and birthing. Mongabay: What are some of the tours that you offer that few people take, but are really special? Olyenka Sang and Manny Jimenes: For us, the southwest region of the Dominican Republic is one of the, if not the, most interesting area to practice nature tourism. It is the most ecologically diverse area of the country with a range of environments including pine forest, dry forest, mangrove swamps, rainforest, cloudforest, and some of our most spectacular beautiful beaches. It is also home to all 31 of our endemic species of birds, two endemic species of iguana, solenodon, hutia, and almost all of our remaining endemic flora and fauna. It is truly a nature lover’s dream. Actually it’s own island up until around 10 million years ago, the southwest portion of the Dominican Republic is also one of the poorest parts of the country and therefore faces many conservation issues due to human deprivation of it’s natural resources. All the more reason to practice sustainable tourism there, which if done right, brings money to the poor communities and pitches in on local conservation efforts. Places like Cachote Cloudforest, Villa Barrancoli Birding Conservation Center, Bahoruco National Park, Cabritos Island on Lake Enriquillo, Jaragua National Park, Oviedo Lagoon, and many others await visitors and are sure to offer an unforgettable, off the beaten path, ecotourism experience. Mangroves in Los Haitises National Park in the Dominican Republic. Photo by: Tiffany Roufs. Mongabay: What are some of the biggest environmental issues facing your country today? Olyenka Sang and Manny Jimenes: Our biggest environmental issues all begin with one thing: education or lack there of. Because of this lack of education we still do not understand consequences for our actions. As a result we see a lot of garbage in our streets, some of our beaches and rivers. There simply isn’t enough respect towards the environment in the Dominican Republic, it’s not something that is taught at home or in the schools. A good example of this is the fact that people who live near river beds, tend to use this as a place to dispose of their garbage, the consequence of this is insane amounts of garbage in some of our beaches. You can also see this same problem in the streets. Our government does not do enough to educate regarding this issue or any other environmental issue for that matter. Mongabay: What does your company do to help alleviate these impacts? A pelican at Cabo Rojo in the Dominican Republic. Photo by: Tiffany Roufs. Olyenka Sang and Manny Jimenes: Apart from our private tours, we host one group trip a week for locals. 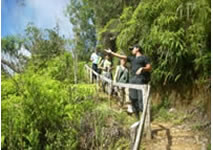 These particular nature tours are very important to us because the whole idea behind it is to take locals out to visit a part of their country that they did not know, hope that they fall in love with the place and then take back with them a new sense of responsibility for preserving our natural resources. The good news is that it is, most of the time, as simple as that. During all of nature tours, conservation and preservation are present at all times, we try and drill it in people’s minds through a memorable experience. We do beach clean ups and plant trees a few times a year; it is our duty to this for mother nature. Nature gives us so much, we have to give something back to it, taking care of it and keeping it clean is our way of saying, thank you, more please. We also encourage our clients to pick up any garbage they find while on one of our tours, some do it, others don’t, but when it comes to preservation, if the message gets across to just one person, then it’s a step in the right direction. Mongabay: How does a country like the Dominican Republic balance development and environmental protection? Olyenka Sang and Manny Jimenes: We have around 34% of the original forest left and more than 50% of the country is protected area under different categories. Even though these numbers are good, there are constant challenges, because our current government’s policy has more to do with development than environmental protection. Environmentalists in the Dominican Republic have to constantly keep a watchful eye to make sure our natural resources are indeed being preserved. Mongabay: How does your company make sure that it supports local economies? Olyenka Sang and Manny Jimenes: By practicing sustainable tourism. Making sure to always work with the little guy versus the big companies. We visit many places where we have the option of using a big (usually foreign owned) company with big boats and their own restaurant that serves fancy food and their own, sometimes foreign, guides, but we simply refuse to work with them. Eating the food prepared by a woman from a local community whose husband caught the fish we are going to eat that same morning, sometimes even in her front porch, as opposed to doing so at a big restaurant or food chain is a great example of helping local economies and we are 100% committed to this; and just so you know, this simple prepared lunch is usually the best lunch you can have while visiting our country! Mongabay: What’s your favorite place in the Dominican Republic? Olyenka Sang and Manny Jimenes: Many people ask us this question and it is always hard for us to answer because we have so much. Each park or nature preserve has something very special to offer, it’s really about our mood for the day and it is very important to add that we are always switching our favorites. But I guess if we have to choose we love Valle Nuevo National Park up in the Central Mountain range and what some call the “Caribbean Alps.” Our favorite beach right now would have to be Frontón beach in Samaná. Enriquillo Lake (in the south west), specifically Cabritos Island in the lake, would be our favorite eco tourism experience, and definitely, observing manatees in Kayak in Estero Hondo is a truly unforgettable experience. Those are our favorites this week, but ask us again in a few weeks and you might find some changes. Oly and Manny hiking in the Dominican Republic. Photo courtesy of Olyenka Sang and Manny Jimenes. A Hispaniolan solenodon (Solenodon paradoxus) with grass seeds on its face near Pedernales, Dominican Republic. Photo by: Tiffany Roufs. A girl plays in the fields in Punta Rusia, Dominican Republic. Photo by: Tiffany Roufs. A lizard near Pedernales, Dominican Republic. Photo by: Tiffany Roufs. Mountain views from the Ebano Verde Scientific Reserve in the Dominican Republic. Photo by: Tiffany Roufs. Royal Terns (Thalasseus maximus) Los Haitises National Park in the Dominican Republic. Photo by: Jeremy Hance. A view from inside the sacred Taino caves in Los Haitises National Park in the Dominican Republic. Photo by: Tiffany Roufs. This entry was posted on August 8, 2013, 10:48 pm and is filed under Local Nature News, Nature News, The Dominican Republic. You can follow any responses to this entry through RSS 2.0. Both comments and pings are currently closed.